OTTAWA, Ont. — By now most of us should be minor experts in spotting rigs with fuel-saving aerodynamic enhancements, like side skirts, boat tails and tractor fairings. But a collaborative research study published this summer by Transport Canada and the National Research Council Canada (NRC) refines and expands the understanding of these enhancements and how much fuel they save. It’s free, it’s not secret and it is loaded with results. Just Google: Improving the Aerodynamic Efficiency of Heavy-Duty Vehicles: Wind Tunnel Test Results of Trailer-Based Drag-Reduction Technologies. You will be led to a Transport Canada Web page with an executive summary, easy-to-read tables with 21 drag reduction techniques, their associated annual fuel savings and CO2 reduction, and a link to the full, meaty study. Using its 9.1×9.1×22.9-metre wind tunnel, the NRC tested 30% scale models of tractors, dry vans and flatbeds to learn more about what works and how well. Transport Canada, through its ecoTechnology for Vehicles program, commissioned the research to help guide it in the implementation and regulation of drag reduction technologies in Canada. Some findings: For every foot the gap between tractor and trailer is reduced, drag drops by 2.6% (a 1% decrease in drag roughly equals a 0.5% decrease in fuel burn). A one-foot gap reduction can save 1,600 litres of fuel, plus or minus 400 litres, a year. (Annual figures refer to a typical long-haul operation). “This is one of the first thorough studies of incremental gap width. This has not been quantified to this extent in the past. The results will help fleets choose which gap widths to use,” says Brian McAuliffe, the study author and thrust lead for the Enhanced Aerodynamics Performance thrust of the Fleet Forward 2020 program of NRC. Removing the landing gear, smoothing the trailer underbody and adding an underbody diffuser fairing appears to slightly increase drag. 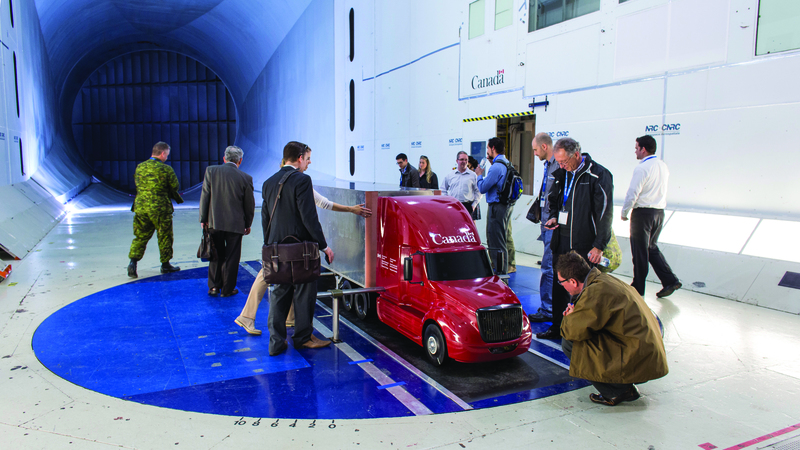 A 30% scale model tractor-trailer was used for testing in an Ottawa wind tunnel as part of the aero study. The drag reduction of side skirts and boat tails in combination is greater than the sum of their individual drag reductions. Yet, combining side skirts with a trailer faring (a rounded piece screwed on the front of the trailer), or combining a boat tail with a trailer fairing do not produce a “greater than sum” enhancement. A box cargo configuration on a flatbed has 22% higher drag than a dry van. Side skirts on a box cargo flatbed reduce drag by 8%. And split skirts for a dry van allow the rear half of the skirts to stay closer to the bogie. “If you have a big gap between the bogie and side skirt, you will have less of a fuel saving,” McAuliffe says. A sleeper cab with two, 28-ft. trailers, which the NRC used to explore fuel savings in long combination vehicles (LCVs), uses three litres per 100 kms more diesel than pulling a single 53-ft. trailer. (A truck getting 4.5 mpg burns 52.2 litres/100 kms). An LCV outfitted with a forward trailer fairing, side skirts on both trailers and a long, four-panel boat tail achieves a fuel saving of 6.3 litres/100 kms, or 7,900 litres, plus or minus 2,200 litres, a year. The NRC investigated the aerodynamic drag of a lot of devices and configurations. They include day cabs, sleeper cabs, high and low roof fairings with high and low trailer heights, tractor-trailer gaps, gap devices, various side skirts, side skirts over tandems and tridems, side skirts and flatbeds, various boat tails, rounded corners on a dry van, LCVs, and combinations of drag-reducing technologies. The NRC went to great lengths to ensure that its tests are ‘real world’ survivable. “In the current study the measurements would be extremely close to those you would measure in real life,” McAuliffe says. For example, the NRC determined that its realistically detailed 30% scale models are just right for testing. Larger and smaller models in other tests have produced some unreliable results. A “rolling road” on the wind tunnel floor, combined with spinning wheels, creates realistic ground effects. Using North American wind data, the NRC factored a continental 11 km/h average wind speed in its tests. It also added turbulence to simulate gusty conditions. Anticipating the “what about cross-winds?” criticism, the NRC ran each test with the models turned at various yaw angles to the wind, and built an average crosswind into its results. In fact, what the study revealed about the performance of configurations and technologies at different yaw angles brings carriers closer to being able to select the aerodynamic devices best suited for a specific route, with its own particular wind conditions. “We also want to understand drag for a particular duty cycle. Our thought is that some fleets might only be able to afford one technology. Which one is best for a specific application? In the future a fleet will be able to get help from the NRC in choosing what works best for them,” McAuliffe says. While the 95-page study looks intimidating at a glance, and speaks to aerodynamicists, it is mostly quite easy to understand, if not digestible in one sitting. Fuel savings are reported in litres and dollars, at $1.34/litre, assuming an average 156,000 kms driven per year, and a driving speed of 100 km/h for 125,000 of those kilometres. There are also many excellent photos to help keep readers between the ditches. Once introductions are made and the research methodology explained in sections one and two, each of the next five sections looks at different parts of the rig. At the end of each section is a handy summary of the findings. Section three covers drag characteristics of tractor-trailer combinations. It discusses the drag of day and sleeper cabs, dry vans of different lengths, flatbeds and an LCV. Sample finding: A sleeper cab pulling a 53-ft. dry van will cost $2,600 less a year, plus or minus $700, in fuel than using a day cab. Section four is packed with a discussion of drag reduction methods for four areas of dry vans: tractor-trailer gap, trailer underbody (which includes side skirts), trailer base (the rear end, where the boat tails go), trailer upper body and combinations and interactions. Sample finding: side skirts extended over the trailer wheels provide additional drag reduction. Section five discusses flatbeds and the effect of box-cargo, tube-cargo, and side skirts on drag. Sample finding: Side skirts work for flatbeds and decrease drag the most when carrying box-cargo. Section six discusses drag reduction for LCVs. Here, trailer fairings, side skirts, gap width and full aerodynamic packages are discussed. Sample finding: Reducing the trailer-trailer gap width from five feet to three feet improves fuel mileage by 1.5 litres/100kms, for an annual saving of $1,900, plus or minus $500. Section seven looks at the aerodynamic matching of tractor and trailer height. The NRC matched day cabs and sleeper cabs, fitted with different roof fairings and deflectors, with tall and low dry vans, and flatbeds carrying tube-cargo. The fuel savings and waste associated with good and poor height matching are impressive. Sample finding: The aerodynamic performance of a simple deflector decreases in cross winds.